I have been refinishing, repairing and restoring furniture for over 50 years. Professionally we have been open for over 25 years. In all that time we have received hundreds of phone calls from DIYer’s asking how we do one thing or another. We are unable, for a long list of reasons, to answer most questions. It’s really not possible to diagnose a problem and guide someone through a project on the phone, so we simply don’t try. Some people are a little upset that we don’t provide the simple, cheap solution they are looking for, but they are not the ones paying our bills. Here is a picture with the answer! 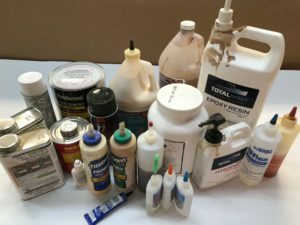 There are about a dozen different adhesive products in this photo that we use every day. All are the best for the job, although each job may be different. There are a few others we use on an occasional basis that are not pictured. Either because we don’t keep them in stock, or we are out right now, or I forgot them. If you look closely you will notice a couple of things by their absence. There is nothing with a picture of a hairy ape, or a poly-anything. There’s a good reason for that! Visit our website for examples of our work and tons more information about our furniture restoration, repair and fabrication.